This boyhood home of poet Henry Wadsworth Longfellow was built in 1785-86 by the poet's maternal grandfather, General Peleg Wadsworth. 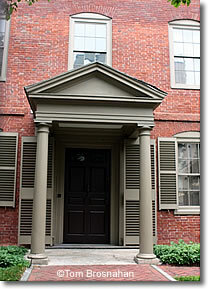 The Wadsworth-Longfellow House is where Henry Wadsworth Longfellow (1807-1882) grew up. Built by Henry's grandfather, it was the first completely brick house in Portland. Good thing: Peleg and his wife Elizabeth raised ten children in it, including daughter Zilpah, who married Stephen Longfellow and bore him the son they named Henry. Henry moved out (to the Longfellow House in Cambridge MA, among other places), but his younger sister, Anne Longfellow Pierce, continued to live in the house until her death in 1901. The house and its family furnishings were willed to the Maine Historical Society, which has preserved it as a museum to the poet and his family. Virtually all of the furnishings are family possessions. There's a beautiful colonial revival garden, and the headquarters of the Maine Historical Society is located right next door. Precede your visit to the Wadsworth-Longfellow House with a visit to the Tate House, and follow it with a visit to the Victoria House, to get an overview of upper-class domestic architecture in Portland from the colonial period to the Civil War era. Follow ME Route 22, which leads to Congress Street, to the house.